What would you have done with the jugs of water? Weddings and wine. They've been married for centuries and yet some Christians would be more than happy if they'd get a divorce. Let's face it: what would you do if you went to a wedding and ran into Jesus as the bartender? Which is exactly what happens when Jesus shows up at a wedding. Here's the storyline: Jesus and his disciples got invited to a wedding. While there the host runs out of wine. Jesus gets pestered by his mother to do something about the situation. So he does. He takes six thirty-gallon jars of water and turns them into wine. Not cheap "two buck Chuck" wine. Really good wine (John 2:1-10). John tells us this was the first of his signs and it manifested his glory (John 2:11). It's easy to see his glory when he raises Lazarus from the dead. We might even say "Glory!" when he gives a blind man his sight. But turning water into wine at a wedding? Why did John begin his gospel with this story? Jesus performed many other signs in the presence of his disciples, which are not recorded in this book. But these are written that you may believe that Jesus is the Messiah, the Son of God, and that by believing you may have life in his name (John 20:30-31 NIV). At a wedding we meet a Jesus we can believe in. Don't miss the profound fact that Jesus showed up at a wedding. He was on the invitation list. There was something about Jesus that got him an invitation to a celebration. People liked to be around him. He knew how to listen. He knew how to tell a story. He knew how to laugh. He loved to be with people. Even at a wedding where there is wine. At least for a while there was wine. But at some point it ran out. Jesus was sensitive to their plight. 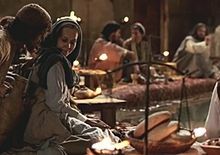 Understand that weddings in Jesus' day were a bit different than now. They lasted several days. There would be gift giving, speech making, food eating and lots of wine drinking. There was a high protocol for everything. If you showed up with the wrong gift you could be blacklisted from social circles. And, if you as the host ran out of food and wine, not only would it be a huge embarrassment but your guests could bring a lawsuit against you. You'll want to be on the invitation list! 180 gallons of the best wine. One estimate placed the worth of the wine at $27,000! Jesus knew how to get them out of a jam. 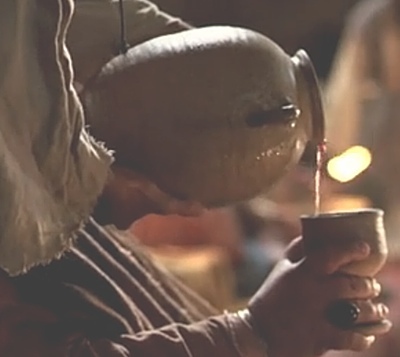 He didn't say, "I came to preach, not turn water into wine." He didn't say, "I'd better not perform this miracle because it will cause arguments in Bible study groups from now till eternity." He just helped. In doing so he teaches us to begin with the person's felt need. Jesus begins with us where we are. Anyone who is a follower of Jesus believes that every person's real need is God. But they don't always see that. All they can see is the felt need at hand. They may feel lonely. They may feel they are married to the wrong person. They may feel they don't have enough money. It may be the surface problem for something that is going on deeper beneath, but this is where we start. They don't need a lecture. They need Jesus. And by being at a wedding Jesus met them where they were. But here on this mountain, GOD of-the-Angel-Armies will throw a feast for all the people of the world, A feast of the finest foods, a feast with vintage wines, a feast of seven courses, a feast lavish with gourmet desserts. And here on this mountain, GOD will banish the pall of doom hanging over all peoples, The shadow of doom darkening all nations (Isaiah 25:6-7 MSG). Better get comfortable with it now. You'll want to be on the invitation list then. "Practice the Wine of Kindness" by Rick Brown is licensed under a Creative Commons License. Heartlight encourages you to share this material with others in church bulletins, personal emails, and other non-commercial uses. Please see our Usage Guidelines for more information.